Every time a character is typed on a keyboard a code number is transmitted to the computer. The code numbers are stored in binary on computers as Character Sets called ASCII. 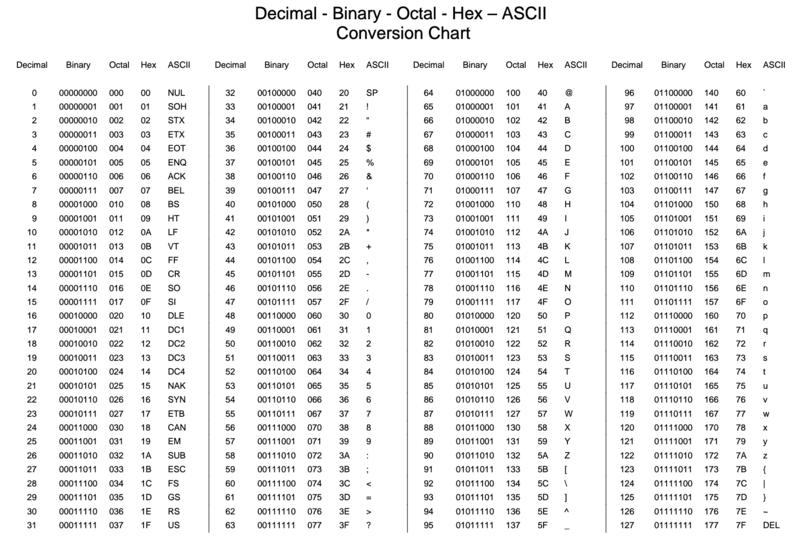 The table below shows a version of ASCII that uses 7 bits to code each character. The biggest number that can be held in 7-bits is 1111111 in binary (127 in decimal). Therefore 128 different characters can be represented in the ASCII character set (Using codes 0 to 127). More than enough to cover all of the characters on a standard English-Language keyboard. Click here for the full ASCII table. It only uses English alphabets. It is limited to 7-bits, so it can only represent 128 distinct characters. It is not usable for non-latin languages, such as Chinese. Character form of a decimal digit In ASCII, the number character is not the same as the actual number value. For example, the ASCII value 011 0100 will print the character '4', the binary value is actually equal to the decimal number 52. Therefore ASCII cannot be used for arithmetic. The character codes are grouped and run in sequence; i.e. If A is 65 then C must be 67. The pattern applies to other groupings such as digits and lowercase letters, so you can say that since 7 is 55, 9 must be 57. Also, 7 < 9 and a > A. Notice that the ASCII code value for 5 (0011 0101) is different from the pure binary value for 5 (0000 0101). That's why you cannot calculate with numbers which are input as strings. Another example, the ASCII value 011 0100 will print the character 4, the binary value is actually equal to the decimal number 52. The basic ASCII codes use 7-bits for each character (As shown in the table above). This gives a total of 128 (27) possible unique symbols. The Extended ASCII character set uses 8-bits, which gives an additional 128 characters (i.e. 256 in total). The extra characters represent characters from foreign languages and special symbols such as Ö € or →. Unicode (Unique, Universal, and Uniform character enCoding) is the new standard for representing characters of all the languages of the World. This has been introduced to address the shortcomings of ASCII. The latest version of Unicode contains a repertoire of more than 120,000 characters covering 129 modern and historic scripts, as well as multiple symbol sets. ASCII character encoding is a subset of Unicode. Unicode uses between 8 and 32 bits per character and has the advantage that it represents many more unique characters than ASCII because of the larger number of bits available to store a character code. It uses the same codes as ASCII up to 127. Its major advantage is that it provides a unique standard for all the World's writing systems. It allows for multilingual text in any language. Can have representation of a greater range of characters. More languages or all (modern) languages can be represented (in one character set). Improved portability of documents in Unicode as each character has a unique representation in Unicode. Platinum: Create an algorithm asking a user to input a sentence and then print the codes (in decimal) for each of the characters or symbols with each one printed on a new line. Code and test the algorithm in Python. Extend this further by creating a function for this and to also accept a decimal value which then returns the ASCII character.